The US Defense Department's Advanced Research Projects Agency DARPA is building a flying aircraft carrier. It's a transport and bomber style aircraft carrier capable of launching and recovering swarms of fighter, killer drones in mid-flight. The flying aircraft carrier, which may itself be a drone, is a key component of the military's Gremlins drone program, a strategic part of future warfighting. The options for in-air, recovery of the drones include recovery bays on the carrier wings or recovering them in the cargo bay. Tests to demonstrate launch and recovery of swarms of drones from a C-130 will take place in 2019. The first phase of determining the feasibility of the program ended successfully in March. Second phase involves full scale test demonstrations. Dynetics and General Atomics Aeronautical Systems are contracted and now designing prototype drones. DARPA is jump-starting the Gremlins with C-130's as motherships. Among others, The Navy Times reports that DARPA is developing a flying aircraft carrier. What's intriguing is the technology in The TERN drone, which we blogged about earlier this week, may have significant applications for the Gremlins' future in-air mothership. The TERN is a drone gamechanger. It's able to vertically take off and land on virtually any naval vessel with a deck. It can strike targets 600 miles away with payloads up to 600 pounds. The Gremlin drone has a range of 300 nautical miles and can carry a payload up to 60 pounds. The military hopes to reuse each at least 20 times. Each is outfitted with different payloads for different missions, including electronic warfare, ISR (intelligence, surveillance and reconnaissance), kinetic effects and signals intelligence. What's more DARPA wants to keep the price-tag below $500,000 for each....which for a weapon of war is a bargain. Drone warfare is a major component of US military and foreign policy. 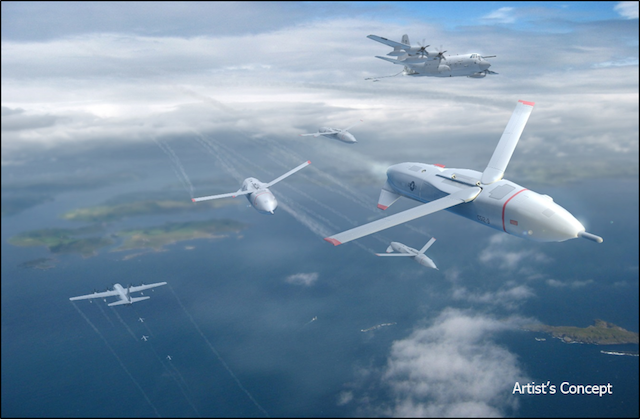 According to DARPA, the Gremlins program will give the military "improved operational flexibility at a much lower cost." Next step now under development: the Mother drone.